(October 28, 2010) The confluence of a world premiere and a workshop performance by students, adults who are amateur musicians, and skilled professionals made for a rare and uplifting experience Saturday night in a program presented by the Playhouse Project at the Ross School in East Hampton. The premiere was of “Laudate Dominum” by Roger Ames, a prolific composer and music educator who has a house in Springs. 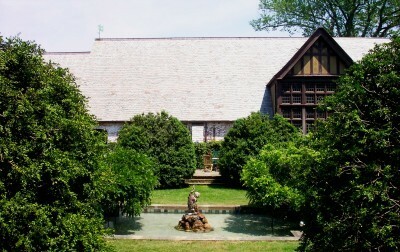 The eight-minute piece, for four-part chorus, strings, and piano, was written in gratitude for Leonard Bernstein, who, Mr. Ames said, “was not afraid to wear his emotions on his sleeve.” It was commissioned by the Playhouse Project, a nonprofit organization based at the Woodhouse Playhouse on Huntting Lane in East Hampton, and conceived in collaboration with Geoffrey Simon, a conductor who is the Playhouse Project’s music guru. Saturday’s workshop was the Playhouse Project’s third. In themselves, the workshops are unusual because, in Mr. Simon’s words, they bring “together every element of the wonderful music community” for a weekend of intense music-making that culminates in performances that allow audiences to witness the rehearsal, and learning, process. The participants Saturday came from all over the South Fork and UpIsland, where Mr. Ames is director of vocal music and resident composer at Great Neck North High School. A few of the string players were as young as 11. The musical program was preceded by a brief discussion led by Richard Brockman, who with Mirra Bank founded the organization. It also included the “Lacrimosa” from the Mozart Requiem, for chorus, strings, winds, and timpani, and Grieg’s Holberg Suite for string orchestra. 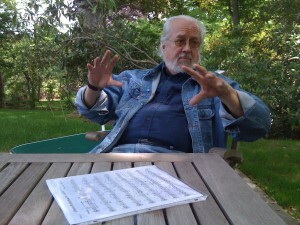 Mr. Ames’s compositions include operas, musicals, song cycles, and oratorios and other choral works. He is the recipient of numerous competitive prizes, and was nominated for a Pulitzer Prize in 2008. One of his musicals, “How Green Was My Valley,” recently was staged as a workshop at the Actors Studio in New York. Among other posts, Mr. Ames is artist in residence at New Dramatists and educational consultant for Opera America, for whose textbook on opera he was a principal author. The workshops are an outgrowth of the Playhouse Project’s primary mission, which is to give students in local schools an opportunity to expand their gifts in master classes and to vie for scholarships for advanced study. 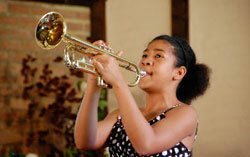 The project is funded by donations and a concert in June at which the prize-winning students appear with professionals. 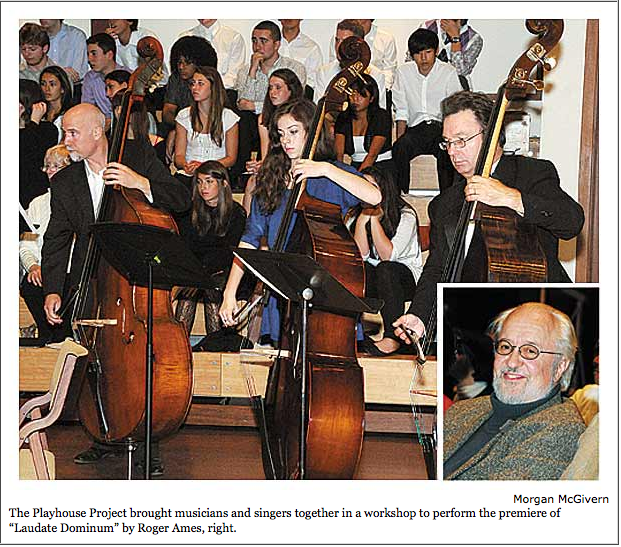 Acknowledged at Saturday’s performance were music directors who helped prepare their charges for the workshop: Adam Judd of the Ross School, David Douglas and Marilyn Van Scoyoc of East Hampton High School, Mark Mangini, music director of the Choral Society of the Hamptons, and Ken Vignona of the Peconic Youth Orchestra, among others. A contingent of singers from Great Neck North High School also took part. One of Mr. Ames’s pieces, “Choral Reflections on Amazing Grace,” had been included in the project’s first workshop performance two years ago. It led to the commission. “Laudate Dominum” is to be performed again by Mr. Ames’s Great Neck students with other students at Princeton (N.J.) High School, and the Westminster Choir College is adding it to its repertory.